Greenhorns & Sustainable Foodie Types across the country are harvest and savoring the first green growing things of the season – asparagus, fiddleheads, ramps, radishes. Here’s Greenhorn Zoe Bradbury’s take on her first official harvest – Asparagus. Via Edible Portland. I had my first official asparagus harvest this week and it was mesmerizing. Logging those spears one by one, down each row and back up the next with a sharp knife, I felt like a gleeful little kid on an Easter egg hunt: every asparagus a surprise and a treasure. They are an amazing, mysterious vegetable, a pure Spring life force thrusting out of the ground towards the April sky. A quick glance and you wouldn’t even know they are there – no leaves, no fanfare, just long rows of single, slender stalks quietly defying gravity in the race to become an asparagus fern. They are all muscle: Name any other vegetable that can grow nine inches in one day, emerging fearlessly from cold, wet spring soil while everything else is still living a cush, pampered life in the greenhouse. If there were Vegetable Olympics, these babies would win some medals. My first harvest feels like a major milestone as I head into my second season on the farm. These are the perennials that I painstakingly researched, planted and tended last year, but never got to eat or sell because it’s hands-off-the-goods during the establishment year. 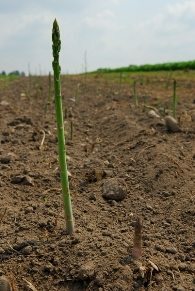 Planting asparagus – which can produce for 20 years – was a hopeful investment in the future, a long-term commitment to this farming odyssey. I suppose a little part of me doubted that they would actually grow – that I would do something wrong and kill all 2,600 crowns I planted. And somewhere behind that doubt was the lingering question mark about whether I, like a sturdy asparagus, could defy the odds and the statistics to muscle my way up as a young, female, beginning farmer. I almost cried when I saw the first ones push up out of the ground. Part of the reason my first harvest was such a celebration was that it symbolized having made it through Year One. Survived, and maybe even turned the corner from anxiously scrapping to walking on my own two feet. The asparagus will give the gift of Spring cash this year where last year I was spending in the red. And close on their heels, the June-bearing raspberries are leafed out and the strawberries are in bloom. It feels like that first year of hustling and guessing and sweating and hoping might begin to pay off. No doubt, spring inevitably gives farmers a run for their money. Between wet ground and slugs and freak hailstorms there is always an opportunity for an ulcer, but I knew that was part of the deal I signed up for. It’s the baseline stress that is easing up – that back-of-the-head curiosity about whether or not I would be able to pull this thing off. This week, bucketloads of asparagus feel like a good sign.